Following the success of the sold-out Winter Leadership Conference in Arizona, Women in Auto Care is joining with AIA Canada to present the first-of-its-kind international 2018 Women’s Leadership Conference. The event will take place June 13-14, in Toronto, Canada at the Hyatt Regency Toronto. 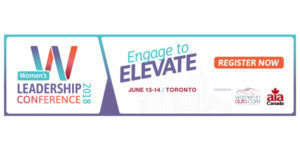 The conference theme, “Engage to Elevate,” aims to elevate the ideas, insights and influence of women across the industry.